Tickets are still available to see Bob Costas at the last Maverick Speakers Series event for the 2014-15 season. An acclaimed sportscaster and 26-time Emmy Award winner, Costas will discuss "Sports in America: Is It Still Only a Game?" at 7:30 p.m. Monday, April 13, in College Park Center. He has been on air for NBC Sports since the early 1980s, hosting the network's Olympics coverage and Football Night in America. Preferred seating and free general admission tickets are available at utatickets.com. 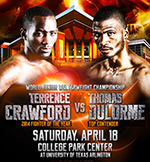 For VIP tickets, contact Mark LaVelle at mlavelle@uta.edu or 817-272-5235. The Maverick Speakers Series provides a forum for today’s brightest minds to examine the people, ideas, actions, and solutions that impact the world around us. Gain hands-on experience with UTA Libraries' new TelePresence robots at two workshops this week. Practice using the robots and ask library staff questions. Bring your laptops, webcams, and smartphones for a full experience. The workshops are 11 a.m.-noon Wednesday, April 8, and 3-4 p.m. Thursday, April 9, in the basement of the Central Library. Register online. Distance education students can attend virtually by registering then emailing Marquel Anteola at manteola@uta.edu. Watch the video of the Double robot at work in the FabLab. 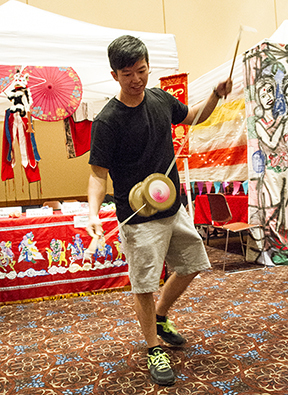 Bruce Lu, industrial engineering graduate student, demonstrates a diabolo, a Chinese yo-yo, after the International Week banner parade was canceled because of rain on Monday. He showed his skills among display booths in the Bluebonnet Ballroom of the E.H. Hereford University Center. Read more about International Week at right. Different student-led nationality organizations participate in the annual International Week celebration, hosted by the International Student Organization. The popular International Food Fair is 11 a.m.-3 p.m. today, Tuesday, April 7, on the University Center mall. The I-Week Fashion Show features traditional and modern clothing from around the world modeled by UT Arlington students at 7 p.m. Wednesday, April 8, in the Bluebonnet Ballroom of the University Center. See the International Week schedule for more events. UT Arlington won in the large university division of the first 3R Actions Challenge, part of RecycleMania, a national competition for universities. UTA students participated in 5,257 actions of recycling, reusing, and reducing waste. The final results of RecycleMania 2015 will be announced Monday, April 13. The College of Nursing and Health Innovation will hold a disaster preparedness simulation for students from 9 a.m.-noon Friday, April 10, at the Fields Complex. UT Arlington Police, Arlington Medical Response, Arlington Police Department, Arlington Fire Department, and PHI Helicopter are planning to participate in the simulation. More than 100 senior nursing students also will participate in the drill. The event will include a decontamination tent and gear, armored police vehicle, manikins for triage, and several “walking wounded” participants. The site is east of Arlington’s Swift Elementary School, 1101 S. Fielder Road. Two events on the west side of campus will reserve parking lots this week and weekend. Lot 33 north of the Maverick Activities Center will be reserved Wednesday, April 8, for the Health Job Fair vendor parking. The reserved area will close at midnight the night before the event. Parking options include permit spaces in Lots 49, 50, 51, and 52 in the south part of campus. Lots 30 and 33 will be used for the Starpower Dance Event parking at Texas Hall beginning at 6 a.m. Friday, April 10-Sunday, April 12. Lots F9 (Davis Hall), Trinity, and Trinity South will be used starting at 6 a.m. on Saturday, April 11. Parking staff will collect a fee at each lot for parking Friday-Saturday. However, all UT Arlington annual permits are valid in these lots without an additional charge. 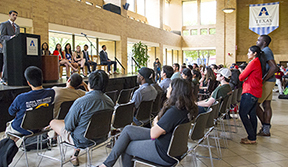 Students heard from Student Congress candidates at a forum Monday in the Palo Duro Lounge. Voting is Monday-Tuesday, April 13-14, for Student Congress president and vice president, congress senators, Mr. and Ms. UTA, UTA Ambassadors, and Student Service Allocation Committee representatives. UTA's political experts explain everything from foreign affairs to health care during Political Science Week. Tuesday, April 7—Brent Sasley, associate professor, “Assessing the Obama Administration’s International Policy,” and Burcu Bayram, assistant professor, “From Class to Paycheck: What to Do with International Relations Knowledge." 12:30-1:30 p.m., Room 110, Pickard Hall. Wednesday, April 8—Thomas Marshall, professor, and Allan Saxe, associate professor, “Off to the Races: Electing a President in 2016.” Noon-1 p.m., Room 108, University Hall. Thursday, April 9—Daniel Sledge, assistant professor, “Dismantling Obamacare? King v. Burwell and the Future of American Health Insurance.” 12:45-1:30 p.m., Room 110, Pickard Hall. Friday, April 10—Joshua Kertzer of Harvard University speaks on foreign policy, international security, and the political psychology of international relations. Noon-1 p.m., Room 116, University Hall. Duke, a therapy dog with Paws with Partners, receives as much stress reduction as he dishes out at Tail Waggin' Wednesday last week at the Central Library. All proceeds will be donated to the UTA Student Emergency Assistance Fund. The Freshmen Leaders on Campus sponsor the event. Faculty and staff recommendations are needed. If you know a student who would be a good peer educator and who would represent the best and brightest of UT Arlington’s student body, refer them to uta.edu/tutoringjobs. The application deadline for all peer educator positions is April 30. 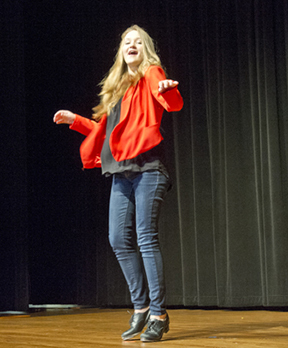 Elizabeth Walsh, kinesiology freshman, tap danced for her Mavs Got Talent performance last Tuesday. Students auditioned for the talent show earlier this semester. Do you have work-study funding and need a job? Several openings on campus are listed on Snap Jobs. For more details and to apply, go to UTA's Snap Jobs site. Receive a 20 percent discount on tickets to the World Junior Welterweight Championship through today, Tuesday, April 7. A month of musical performances showcases artists in the Department of Music. Start the entertainment with the Honors Recital today, Tuesday, April 7. 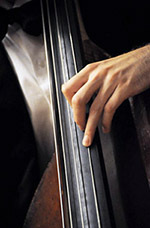 Other free concerts and recitals feature music faculty members, students, and guests. See the schedule. Michael Varner performs his 34th annual faculty percussion recital Thursday, April 9. The free program includes the premiere of two compositions. Don't miss the UTA jazz performances at the Main St. Fort Worth Arts Festival on Saturday, April 11. The Jazz Band plays at 11 a.m., the Jazz Ensemble at 12:30 p.m., and the Jazz Orchestra at 2 p.m., all on the Main Stage at Main and Ninth streets. The festival is free. The Spring Jazz Concert is set for Thursday, April 16; the UTA Symphony Orchestra performs Saturday, April 25; and the UTA Choir Concert gets vocal Thursday, April 30. Tickets for each of the three concerts are $9 for adults and $5 for students and seniors. Tickets are available at utatickets.com and at the door. All on-campus concerts are at 7:30 p.m. in Irons Recital Hall of the Fine Arts Building. Afternoon Variety Showcase: So Long Solo Indie folk/pop duo performs. Free. 11 a.m., Palo Duro Lounge, E.H. Hereford University Center. EXCEL Campus Activities. Math Major Day Learn about careers in mathematics and professional development for the student mathematician in the 21st century. Food, door prizes, giveaways. 11:30 a.m.-1 p.m., Room 309, Pickard Hall. Mathematics. Homerathon A marathon recitation of Homer's "The Odyssey." Homerathon T-shirts and coffee mugs for sale. Register to volunteer. 7 a.m.-10:30 p.m. on the University Center mall. Classical Studies. Softball Mavericks vs. Central Arkansas. Tickets $5-7; $3 students. 3 p.m. and 5 p.m., Allan Saxe Field. Athletics. Main St. Fort Worth Arts Festival UT Arlington sponsors the Main Stage at Main and Ninth streets in the Sundance Square area of downtown Fort Worth. Saturday performances by UTA's Jazz Band, 11 a.m.; Jazz Ensemble, 12:30 p.m.; and Jazz Orchestra, 2 p.m. Find information and swag at the UTA booths. Free. 10 a.m.-8 p.m. Thursday-Saturday, 10 a.m.-6 p.m. Sunday. Main St. Fort Worth Arts Festival. Friday Night Film: 'Interstellar' Rated PG-13. Free, fresh-popped popcorn while supplies last; other concessions for sale. Tickets $1, $1.50 with credit card. 8 p.m., Rosebud Theatre, E.H. Hereford University Center. EXCEL Campus Activities. Jazz Night Vocalist Jai Malano performs. Free. 6 p.m., Palo Duro Lounge, E.H. Hereford University Center. Multicultural Affairs. Student Elections Vote for Student Congress president and vice president, congress senators, Mr. and Ms. UTA, UTA Ambassadors, and Student Service Allocation Committee representatives. Free. 9 a.m.-6 p.m., University Center Gallery, E.H. Hereford University Center. Student Congress. MavPlays A two-week festival of plays, many written, directed, and performed by students. Tickets $7 students, faculty, staff, seniors; $10 public. 8 p.m., Mainstage Theatre. Through April 26. Theatre Arts. Block Party The Block Party provides an end-of-year celebration for on-campus and commuter students alike. Block Party will host live music and also includes carnival-style treats, games, and activities galore. Free. 5-10 p.m., University Center mall. University Events. Advising: Registration on MyMav A refresher on how to add, swap, or drop classes on MyMav. Free. 1:30 p.m., first floor, Ransom Hall. Also, 11:30 a.m. Thursday, April 9, and 10:30 a.m. Friday, April 10. University Advising Center. PUBlic Knowledge Speaker Series James Grover, interim dean of the College of Science and professor of biology, presents “Earth Day Warm Up: Toxic Algae and Managing Texas Water Resources in a Changing World." Free; must be 21 or older. 7 p.m., The Pour House, 2725 W. Seventh St., Fort Worth. Fort Worth Museum of Science and History. National Robotics Week Showcase Today’s most innovative technology by UTA faculty and industry collaborators. To reserve exhibit space, call 817-272-5900 or email utari-events@uta.edu. A shuttle will run between campuses. Free. 10 a.m.-3 p.m., UT Arlington Research Institute, 7300 Jack Newell Blvd. S., Fort Worth. UTARI. Mavs Talk: Self-Compassion Learn aspects of self-compassion and how to be more accepting of yourself. Register or join day of event. Free. 2:30-3:30 p.m., Room 104, Preston Hall. Counseling and Psychological Services. Mix and Mingle Networking and Etiquette Event Practice your mingling skills with local professionals and learn business etiquette. Business professional dress required; suit and tie for men and business suit or dress with jacket for women. Free. 5:30 p.m., Carlisle Suite, E.H. Hereford University Center. Career Development Center. Writing: Effective Charts and Graphs Free. 6:40 p.m., second floor, Central Library. Writing Center. Biology Colloquium Series Rayna Bell of the University of California, Berkeley presents "The Evolution of a Novel Coloration Phenotype in African Reed Frogs." 4 p.m., Room 124, Life Science. Also, Michael Ryan, the Clark Hubbs Regents Professor in Zoology at UT Austin, Thursday, April 16. Biology. 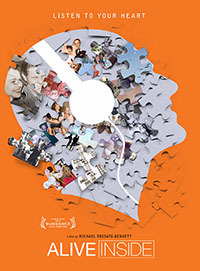 Documentary: 'Alive Inside' Social worker Dan Cohen, founder of Music and Memory nonprofit organization, demonstrates music’s ability to combat memory loss and restore a deep sense of self to those suffering from it. A panel discussion follows. Free. 5:30-8 p.m., Room 109, Social Work Complex Building A. Social Work. Social Work Ethics Forum “Big Data, Privacy, and Your Agency’s Functioning: A Forum on Social Work Ethics in the Age of Electronic Record Keeping and Coordination of Care.” Free but registration required. 1-4 p.m., Room 245, Business Building. Social Work. Engineering Speakers Series President Vistasp Karbhari, professor of engineering, discusses “Engineers: Technicians, Scientists, or Futurists? Where Are We Headed?” Free. 2-3 p.m., Room 105, Nedderman Hall. Engineering. Management Lecture Series Margaret Shaffer of the University of Wisconsin Milwaukee discusses “Global Work Experiences: A Research Journey from Concept Creation to Scale Development to Model Testing.” Free. 2 p.m., Room 140, Business Building. Business. Major Exploration Seminar Discuss resources for choosing a major with an adviser. Free. 4 p.m., Room 104, Preston Hall. University College. , 3:30-4:30 p.m. Thursday, April 30. Both in Room 104, Preston Hall. Counseling and Psychological Services. Advising Service Learning, 11:30 a.m. Tuesday, April 21; 1:30 p.m. Thursday, April 23; 10:15 a.m. Friday, April 24. Prepping for Finals, 1:30 p.m. Tuesday, April 28; 11:30 a.m. Thursday, April 30; 10:15 a.m. Friday, May 1. All in first floor lobby, Ransom Hall. University Advising Center. 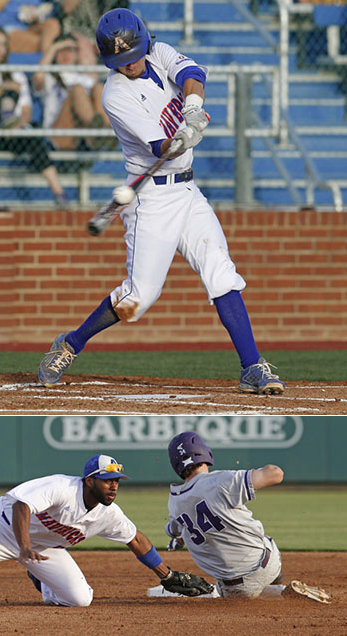 Both sides: Senior Travis Sibley, top, hits one for the Maverick offense while junior Darien McLemore covers defense at a recent Maverick baseball game. The team plays at Baylor today, Tuesday, April 7, before a three-game weekend series against Georgia Southern. The Mavs play at home again Tuesday, April 14, against TCU at Clay Gould Ballpark. UTA scored five runs in the eighth inning Friday to defeat Louisiana-Monroe 10-6 in the first game of a three-game series at Warhawk Field. ULM swept the Mavericks in a doubleheader Saturday, winning the first game 2-1 and taking the second 7-5. UTA is 14-16 overall and 5-7 in the Sun Belt Conference. The team visits Baylor today, Tuesday, April 7, before heading to Statesboro, Ga., for a three-game weekend series against Georgia Southern. South Alabama completed a three-game sweep of the Mavericks with a 9-1 victory Saturday at Allan Saxe Field. UTA dropped a doubleheader to the 24th-ranked Jaguars on Friday. The Mavericks entered the weekend with the nation’s 10th-highest batting average but were unable to string hits together, leaving 25 runners on base in the series. UTA is 22-18 overall and 5-7 in the Sun Belt Conference. The team hosts Central Arkansas in a doubleheader Wednesday, April 8. The Movin' Mavs wheelchair tennis team earned titles at the Cajun Classic International Wheelchair Tennis Tournament on March 27-29 in Baton Rouge, La. , Andreas Kraft in C Division, and Kraft and Juan Soto in C Division Doubles. Soto also took second in C Division. • The women’s tennis team improved to 4-0 in Sun Belt Conference play Sunday after defeating Louisiana-Monroe 4-1 at the UTA Tennis Center. The Mavericks face TCU in Fort Worth on Wednesday, April 8, and host North Texas on Saturday, April 11. • The men’s tennis team defeated Georgia Southern 6-1 on Saturday in Lafayette, La. Sunday’s match against Louisiana-Lafayette was canceled due to inclement weather. Next up is the Sun Belt Conference Championship on Friday, April 17, in New Orleans. • The golf team wraps up play today, Tuesday, April 7, in the Jim West Intercollegiate at Wolfdancer Golf Club in Lost Pines, Texas. • After posting solid performances Friday at the Baylor Invitational, the men’s and women’s track teams return to Waco on Saturday, April 18, for the Michael Johnson Classic. Upcoming entry deadlines for intramural sports include badminton doubles, Sunday, April 12; FIFA video game, Wednesday, May 6; and poker tournament, Thursday, May 7.